I had this great idea to help promote BarkingWife.com by adding our name to the back window on my car. But I got more than what I expected. I never know what is going to happen now when I’m driving around, minding my own business, trying to get too many errands done in not enough time. The first time it happened, I didn’t make the connection. I had just had the back window done. I was flying down the highway and a car pulled up next to me and was pacing me at 65 (or 70-ish) miles per hour. Now, the last time this happened to me was about 5 years ago. And I ended up having to call the police because a crazy man in a white van held up a center fold spread of some nasty pornographic magazine to show me. That still creeps me out. But anyway, back to my story … a lady was driving and honked and honked and when I looked over at her she gave me a thumbs with a big bright smile. I thought, “ That’s kind of strange”. But then I quickly figured it out. She liked the BarkingWife name or idea or maybe she was already using our www.BarkingWife.com service. It was a great feeling; having a random person honk and smile at me. Now this happens all the time to me as I’m driving around the city. On the other hand, one day I was in drive through line at Chic-fil-A and a man walking to his car said to me, “I’m not gonna tell my wife about BarkingWife cause she barks enough at me already." However, most of the time I get those knowing smiles from men and a chuckle when they see my back window. 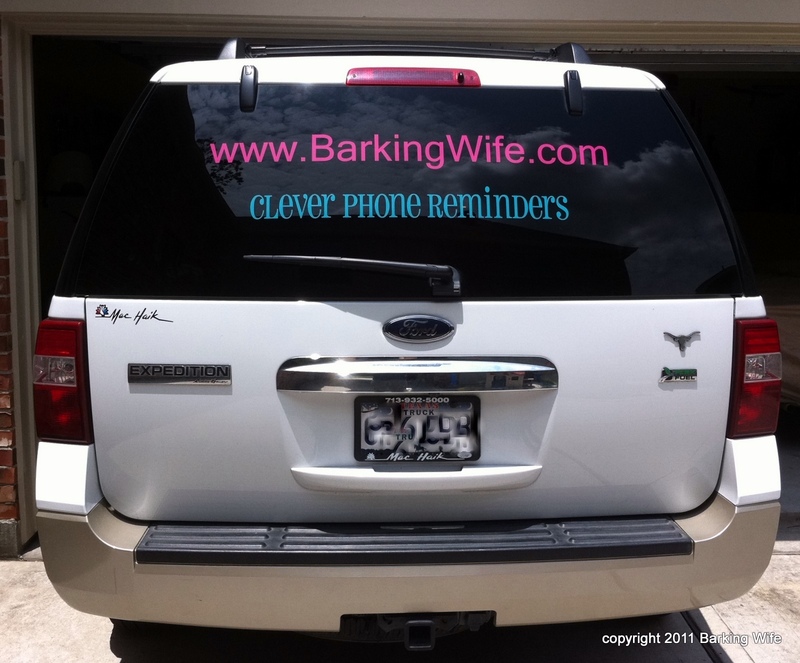 So now I want “Honk if You’re a BarkingWife.com” bumper stickers to give away so you and everyone else can feel the love too!